“Home Truths - how interest rates will hurt”, media headlines this week... I think it’s time for an alternate view. I’ve turned to Google to refresh my memory on interest rates and found the last 50 years worth (see previous post to see these). Check out the rates 25 years ago when we started Toop&Toop and back in 1978 when I first started selling real estate at age 19. I feel it’s time to put this week’s interest rate “HIKE” of 0.25% in perspective. 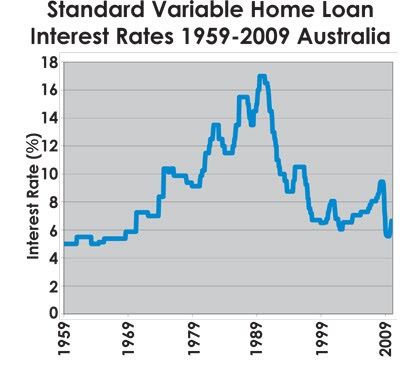 1980 the interest rates were 10.25%, 1990 -16.5% and in 2000 - 7.8%. Now following this week’s rise, the 4% cash rate plus approximately 2.5% margin for the banks, takes the variable home loan rate to just over 6%, once you shop around. The reality is that rates sat above 10% for 20 years, skyrocketing to 17% in June '89. Developers were paying over 20% at that time as were home buyers for bridging loans! In 1992 South Australia’s unemployment rate was double digits at 10.7% while interest rates were 12%... ouch! We also had a massive oversupply of properties with empty houses everywhere... it was a pretty untidy time in real estate, I should know as we started Toop&Toop through that period. Today unemployment is around 5%, interest rates 6.5% and housing supplies are tight. Hmm... given the supply and demand pressure, I have to say this 0.25% rise may have been needed to ensure we prevent a total blowout in housing prices. Overlaying the supply/demand curve for SA property, Adelaide has a new bubble of residents arriving thanks to the defence battalion relocation, with big potential in mining and education. Coming off such a small population base, the impact of these stimulants will impact on all of us here in SA. So let’s all reset our expectations, get our heads around a further 1% rise in interest rates this year and be thankful we’re in such a privileged time in history. If it doesn’t happen, well that’s fantastic. Realistically, so far 2010 is party time for property owners, so just enjoy it while it lasts. If interest rates hit 10%...and unemployment 10%, then it’s time to have a whinge. Toop’s Tip. Fixed rates vs Variable... expect to pay a premium of at least 1% for the privilege of a fixed rate and more if fixing for over a year. Manage your mortgage clinically. Pay it 'as if' you have a long term fixed rate (say 9%), bank the windfall cash (from having the cheaper variable rate) and pay off as much principal as possible - this will bullet proof you against any medium to long term rate movements.